No it’s not a palette full of chocolate, although that would be good too haha! :) Nope, this is where I keep my yummy handmade watercolors. January 2018 edition // when getting ready for a month-long road trip from Texas out to Joshua Tree, California and back. 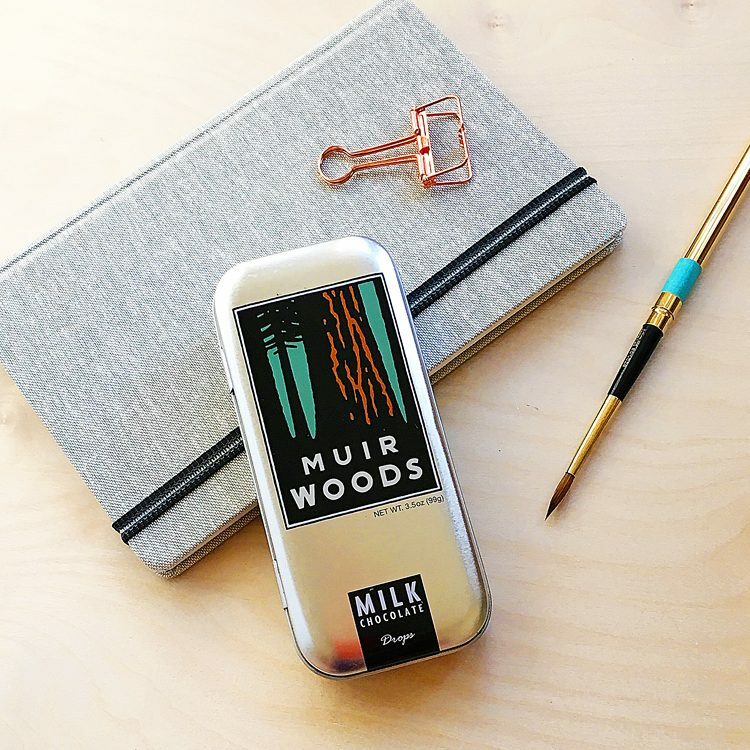 I call it my chocolate palette because they’re in this tin that I got at the gift shop at Marin Headlands/Golden Gate National Recreation area in San Francisco after an awesome day hiking with friends. And that day I was lucky enough to see whales for the first time ever in the wild — so cool! 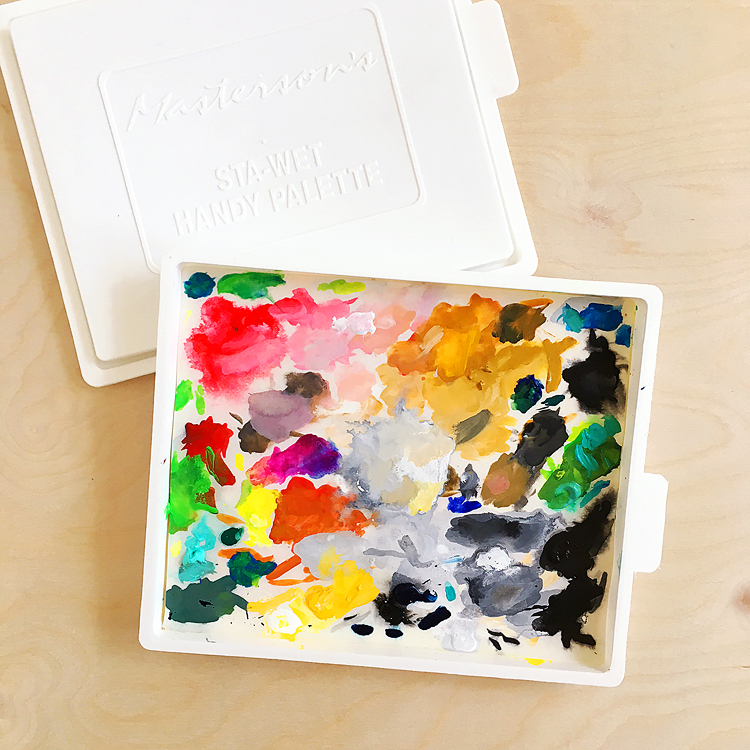 I keep this palette on my desk along with my main palette, and these colors are so amazing you all. Most of these pans are from Case For Making, an amazing art supply shop in San Francisco, and there are a few in here that I made. The thing about handmade watercolors is that they’re so rich and delicious and kinda melty when you paint with them — another chocolate analogy! I never have any problems reactivating the paint. Since they’re just pigment plus watercolor medium they are really saturated. 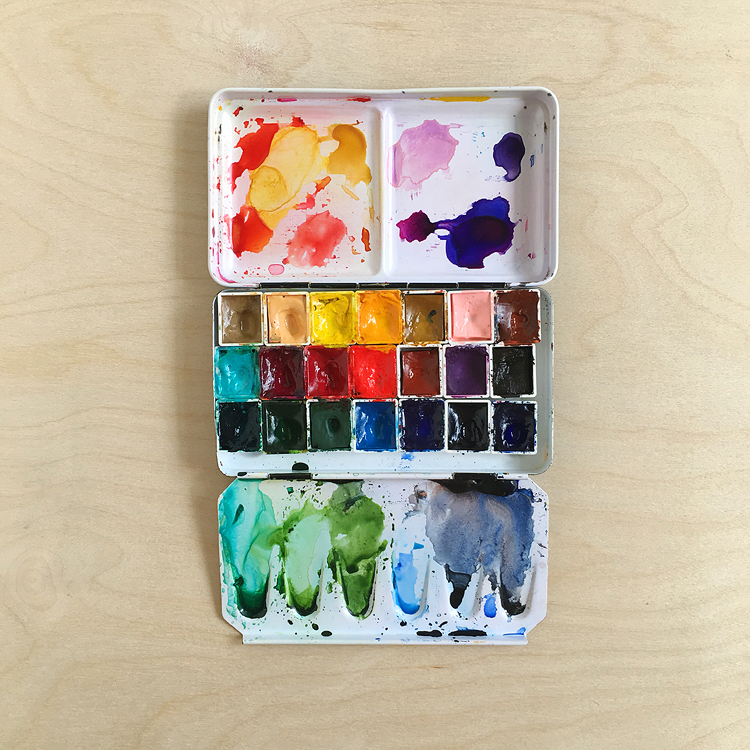 Watercolor medium is made of distilled water, gum arabic, honey, and glycerine. My Chocolate Palette, updated in May 2018 — these are all handmade watercolors, some made by me. The swatches are on Fabriano artistico cold press paper and I tried to make the left side of the swatch darker to show the range. Some colors are so saturated tho that this is hard to do in such a small space. I usually tape this to the inside lid of my pencil box after a palette update, just until I get used to where all the colors are.The pans are held in the tin with these magnets — I just super glued ’em to the pans and they stay in place in the tin, no problem. (S) = made by me! 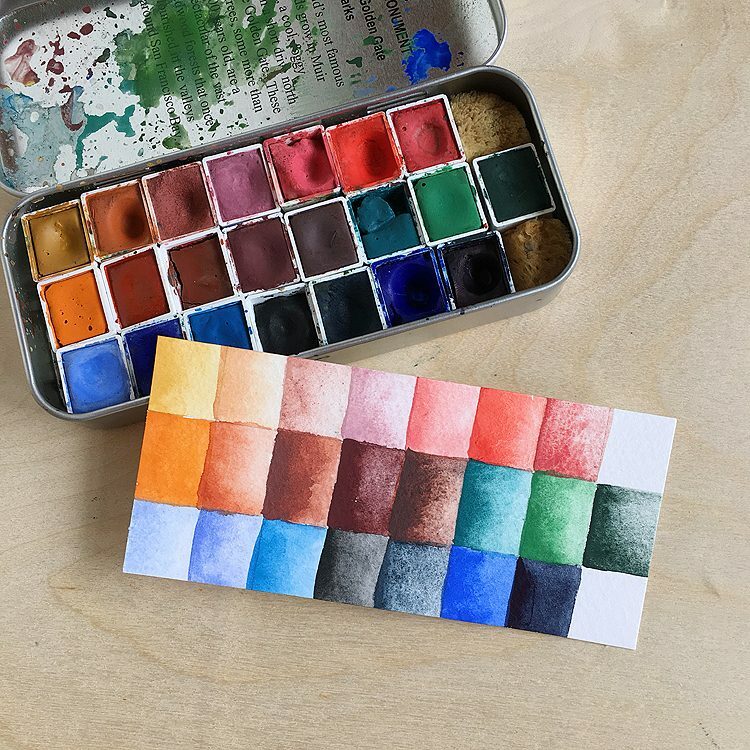 Handmade watercolors behave a little differently than most commercial ones that I know of — I think they’re most similar to the Daniel Smith PrimaTek line that are made from natural rocks and minerals. Handmade watercolors are often highly granulating and most colors that I’ve tried lift easily — some lift a little too easily. 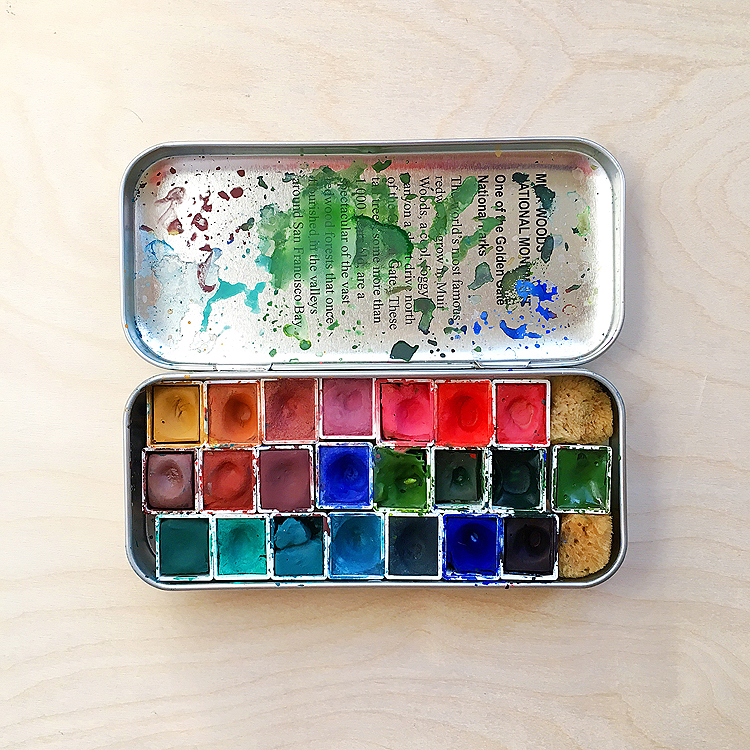 They are beautiful in a wash. Touching a wet brush to them instantly activates the paint — it feels so good to use them. If you’re curious about trying them I’d say give Case For Making’s ultramarine blue or indigo a try — they’re two of my all time fave blues. On the red side, pink pipestone and French vermillion are my top two choices, and then on the yellow end of the spectrum it’s yellow ochre, hands-down. I wanted to add that handmade watercolors can be mixed with commercial colors — no problem! I love using indigo with lots of other colors. Same with French ochre extra light — it’s in my main palette. I learned how to make watercolors at a workshop at Case For Making, see this post on instagram for more — if ever you have a chance to take a workshop with them you totally should!